Polarized 3D glasses create the illusion of three-dimensional images by restricting the light that reaches each eye, an example of stereoscopy which exploits the polarization of light. To present a stereoscopic motion picture, two images are projected superimposed onto the same screen through different polarizing filters. The viewer wears low-cost eyeglasses which contain a pair of different polarizing filters. As each filter passes only that light which is similarly polarized and blocks the light polarized in the opposite direction, each eye sees a different image. This is used to produce a three-dimensional effect by projecting the same scene into both eyes, but depicted from slightly different perspectives. Several people can view the stereoscopic images at the same time. Circularly polarized 3D glasses in front of an LCD tablet with a quarter-wave retarder on top of it; the λ/4 plate at 45° produces a definite handedness, which is transmitted by the left filter but blocked by the right filter. To present a stereoscopic motion picture, two images are projected superimposed onto the same screen through orthogonal polarizing filters (Usually at 45 and 135 degrees).The viewer wears linearly polarized eyeglasses which also contain a pair of orthogonal polarizing filters oriented the same as the projector. As each filter only passes light which is similarly polarized and blocks the orthogonally polarized light, each eye only sees one of the projected images, and the 3D effect is achieved. Linearly polarized glasses require the viewer to keep his head level, as tilting of the viewing filters will cause the images of the left and right channels to bleed over to the opposite channel. This can make prolonged viewing uncomfortable as head movement is limited to maintain the 3D effect. A linear polarizer converts an unpolarized beam into one with a single linear polarization. 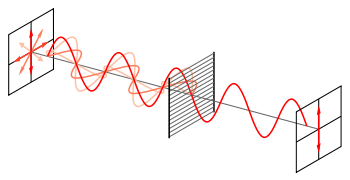 The vertical components of all waves are transmitted, while the horizontal components are absorbed and reflected. To present a stereoscopic motion picture, two images are projected superimposed onto the same screen through circular polarizing filters of opposite handedness. The viewer wears eyeglasses which contain a pair of analyzing filters (circular polarizers mounted in reverse) of opposite handedness. Light that is left-circularly polarized is blocked by the right-handed analyzer, while right-circularly polarized light is extinguished by the left-handed analyzer. The result is similar to that of steroscopic viewing using linearly polarized glasses, except the viewer can tilt his or her head and still maintain left/right separation (although stereoscopic image fusion will be lost due to the mismatch between the eye plane and the original camera plane). As shown in the figure, the analyzing filters are constructed of a quarter-wave plate (QWP) and a linearly polarized filter (LPF). The QWP always transforms circularly polarized light into linearly polarized light. However, the angle of polarization of the linearly polarized light produced by a QWP depends on the handedness of the circularly polarized light entering the QWP. In the illustration, the left-handed circularly polarized light entering the analyzing filter is transformed by the QWP into linearly polarized light which has its direction of polarization along the transmission axis of the LPF. Therefore, in this case the light passes through the LPF. In contrast, right-handed circularly polarized light would have been transformed into linearly polarized light that had its direction of polarization along the absorbing axis of the LPF, which is at right angles to the transmission axis, and it would have therefore been blocked. By rotating either the QWP or the LPF by 90 degrees about an axis perpendicular to its surface (i.e. parallel to the direction of propagation of the light wave), one may build an analyzing filter which blocks left-handed, rather than right-handed circularly polarized light. Interestingly, rotating both the QWP and the PLF by the same angle does not change the behaviour of the analyzing filter. Light reflected from a motion picture screen tends to lose a bit of its polarization, but this problem is eliminated if a silver screen or aluminized screen is used. This means that a pair of aligned DLP projectors, some polarizing filters, a silver screen, and a computer with a dual-head graphics card can be used to form a relatively high-cost (over US$10,000 in 2010) system for displaying stereoscopic 3D data simultaneously to a group of people wearing polarized glasses. In the case of RealD a circularly polarizing liquid crystal filter which can switch polarity many times per second is placed on front of the projector lens. Only one projector is needed, as the left and right eye images are displayed alternately. Sony features a new system called RealD XLS, which shows both circularly polarized images simultaneously: A single 4K projector displays both 2K images above each other, a special lens attachment polarizes and projects the images on top of each other. Thomson Technicolor have produced a system using a split lens which allows traditional 35mm projectors to be adapted to project in 3D using over/under 35mm film. This is a very cost-effective way to convert a screen as all that is needed is the lens and silver screen rather than converting entirely to digital. One can construct a low cost polarized projection system by using a computer with two projectors and an aluminum foil screen. The dull side of aluminum foil is brighter than most silver screens. This was first demonstrated at PhraJomGlao University, Nônthaburi, Thailand, September 2009. Polarizing techniques are easier to apply with cathode ray technology than with LCD. Ordinary LCD screens already contain polarizers for control of pixel presentation — this can interfere with these techniques. In 2003 Keigo Iizuka discovered an inexpensive implementation of this principle on laptop computer displays using cellophane sheets. Polarized stereoscopic pictures have been around since 1936, when Edwin H. Land first applied it to motion pictures. The so called "3-D movie craze" in the years 1952 through 1955 was almost entirely offered in theaters using polarizing projection and glasses. Only a minute amount of the total 3D films shown in the period used the anaglyph color filter method. Linear polarization was also the standard in the 80s. In the 2000s, computer animation, digital projection, and the use of sophisticated IMAX 70mm film projectors, have created an opportunity for a new wave of polarized 3D films. In optometry and ophthalmology, polarized glasses are used for various tests of binocular depth perception (i.e. stereopsis). Compared to anaglyph images, the use of polarized 3D glasses produces a full-color image that is considerably more comfortable to watch and is not subject to binocular rivalry. However, it requires a significant increase in expense: even the low cost polarized glasses typically cost 50% more than comparable red-cyan filters, and while anaglyph 3-D films can be printed on one line of film, a polarized film was often done with a special set up that uses two projectors. The use of multiple projectors also raises issues with synchronization, and a poorly synchronized film would negate any increased comfort from the use of polarization. This problem was solved by a number of single strip polarized systems which were standard in the 1980s. Particularly with the linear polarization schemes popular since the 1950s, the use of linear polarization meant that a level head was required for any sort of comfortable viewing; any effort to tilt the head sideways would result in the polarization failing, ghosting, and both eyes seeing both images. Circular polarization has alleviated this problem, allowing viewers to tilt their heads slightly (although any offset between the eye plane and the original camera plane will still interfere with the perception of depth). Polarized glasses are generally inexpensive. Polarized glasses don't require any power. Polarized glasses don't require a transmitter to synchronize them with the display. Polarized glasses do not suffer from flicker or ghosting effects. The images for polarized glasses have to share the screen simultaneously, and therefore cannot have full resolution delivered to each eye simultaneously. A full 1080p picture results from image fusion.